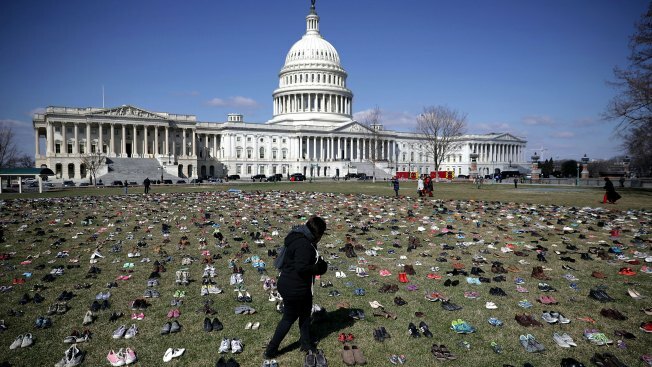 Thousands of children's shoes were on display outside the U.S. Capitol on Tuesday as a temporary memorial to children killed by gun violence. The Monument for Our Kids, made up for 7,000 pairs of shoes, represents every child killed with a gun since the Sandy Hook massacre in 2012, organizers said. The silent protest is intended to put pressure on lawmakers, Oscar Soria, spokesman for the online activist network Avaaz, told News4 last week. The group coordinated the display. "Before so many of us march in our capital and across the nation, we want to call attention to all those who can't and remind Congress that part of why we march is because [gun violence victims] can't," he said. Thousands of children's shoes are on display Tueday outside the U.S. Capitol as a temporary memorial to children killed by gun violence. Gun violence survivors attended the memorial dedication. The shoes were on display until 2 p.m. Tuesday on the southeast lawn of the Capitol. "We want to represent everyone who's been lost," said activist Andrew Nazdin. "We want to bring the tragedy that's been felt in communities across the country right to Congress' doorstep." Shoes were collected at several locations around the D.C. area, and the donation response was overwhelming. Several bags and boxes of shoes were collected in just one day at Barstons Child's Play in Northwest D.C.
"I think people are really moved by trying to do something to prevent gun violence and see this as something they can do," Child's Play owner Simmie Kerman said. Organizers said last month's shooting at Marjory Stoneman Douglas High School in Parkland, Florida, served as a catalyst for creating the memorial and sending a message to lawmakers. 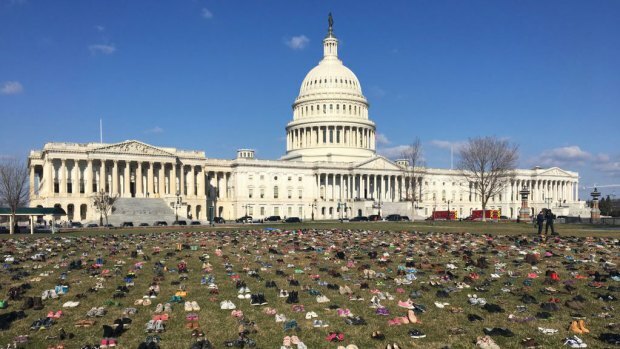 Thousands of children's shoes will go on display Tuesday outside the U.S. Capitol as a temporary memorial to children killed by gun violence. Gun violence survivors will attend the memorial dedication. The shoes will be displayed from 8:30 a.m. to 2 p.m. on the southeast lawn of the Capitol before being donated to local homeless shelters and other charities. Avaaz multiplied the fatality rate by the 5 years and three months that have passed since the Sandy Hook massacre and reached the approximate death toll figure of nearly 7,000 children's lives lost. Avaaz orchestrated a similar display of 11,000 shoes in Paris, in November 2015, to represent activists' opposition to climate change. Authorities cancelled planned marches after the terror attacks in the city that month. Pope Francis and United Nations Secretary General Ban-Ki Moon were among those who donated shoes. The billboards read "Slaughtered in school," "And still no gun control" and "How come, Marco Rubio?" The shoes are set to be donated to local homeless shelters and other charities.